Over 30 musicians from Europe’s wildest corners meet in an epic night of music and dance! After successive sold out shows in 2013, this celebration of Italian and Mediterranean music presents its unmissable festival edition. 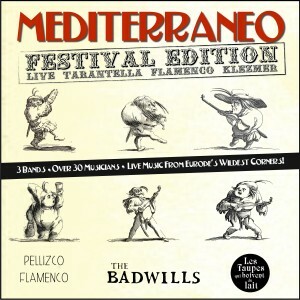 Edinburgh’s own Italian collective The Badwills will play host with their hypnotic mix of tarantella, pizzica and tammurriata. With support from Pellizco Flamenco, bringing you right to the doorstep of Southern Spain, and Belgium’s Les Taupes qui Boivent du Lait with their furious Klezmer and eastern mediterranean brass beats. Get ready to dance, stomp, sing, and let the music launch you across the Mediterranean!